National Pharmacare, active living mobile platforms, and employee engagement in the public sector, were just some of the topics Johnson Shoyama students explored during this year’s 2018 Policy Research Poster Competition. 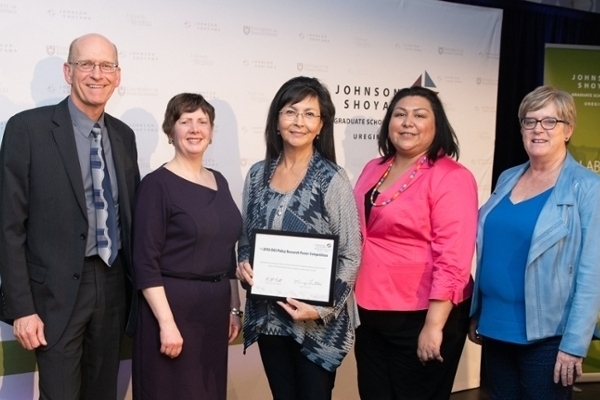 However, it was Marlene McNab’s poster entitled, “Indigenous Child Welfare and Path Dependency,” that took first place. Held on April 19, the two-part event saw students presenting their findings to a panel of esteemed judges in the afternoon, and then again to over 200 members of the public, private, and academic communities during the Tansley Lecture cocktail hour. Lee Anne Schienbein, President of IPAC Saskatchewan, and Crown Counsel in the Saskatchewan Ministry of Justice. In her presentation, Marlene explained how the over-representation of Indigenous children in care is the consequence of a path dependent process initiated by the Indian Act (1876) and reinforced by historical, colonial policies and processes (i.e., residential school system, 60s scoop), resulting in intergenerational trauma and addictions. “Marlene’s poster provided important insights into why Indigenous children are overrepresented in foster care, insights that can only be achieved by digging into and working with concepts such as path dependence.” says JSGS Director, Murray Fulton, who supervised McNab’s research. In order to carve a new path, Marlene believes it is imperative that the federal government implement the Truth and Reconciliation Commission’s Child Welfare Calls to Action, and comply with the findings of the Canadian Human Rights Tribunal. She also thinks an essential part of the reconciliation process is the reformation of government policies and practices that support Indigenous nation building. McNab was grateful for the opportunity to present her research. She encourages future students to consider topics that provide opportunity for self-growth. In recognition of her accomplishment, Marlene will be presenting her poster against other policy students from across Canada at the upcoming Institute of Public Administration (IPAC) Annual Conference in Québec City on August 19-22. While at the conference, Marlene will have the opportunity to hear from leading experts and practitioners about the complex governance of a State under pressure, new models of intervention, and future prospects. Sophia Jesow, winner of the 2017 Poster Case Competition, appreciated the opportunity to present her research on a national platform, while taking in the sites of Canada’s east coast. She felt that it was an excellent way to bring awareness and widespread understanding to her research, which focused on Northern Saskatchewan’s youth suicide crisis. “I had the unique opportunity to participate in the 2017 National IPAC Conference, where I was awarded the 2017 National Student Award in Public Policy and Administration. I was so grateful to have met public servants from all levels of government from all over the country,” says Jesow. The JSGS Student Experience Officer, Tianna Yaskow, acknowledges the poster competition as an excellent opportunity for students to present their research to an accomplished panel of judges, and to network with peers and potential employers. She also believes that the competition is an important part of the experiential learning opportunities afforded to JSGS students and that it is indicative of the talented students coming out of the school. Click here to learn more about the Policy Research Poster Competition.